Ignorant. Brutal. Male. One of these stereotypes of the Ku Klux Klan offers a misleading picture. 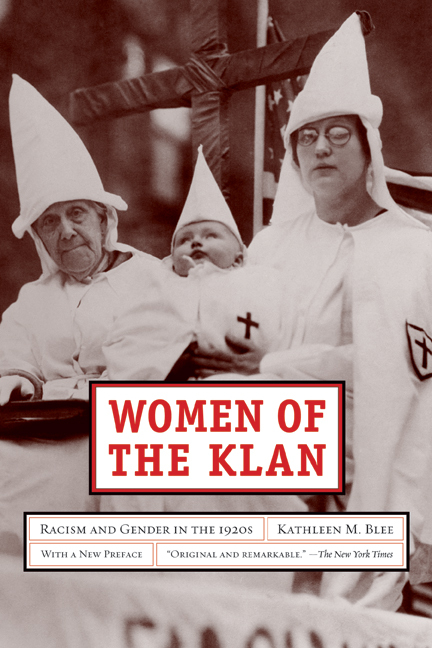 In Women of the Klan, sociologist Kathleen M. Blee dismantles the popular notion that politically involved women are always inspired by pacifism, equality, and justice. In her new preface, Blee reflects on how recent scholarship on gender and right-wing extremism suggests new ways to understand women's place in the 1920s Klan's crusade for white and Christian supremacy. Kathleen M. Blee is Distinguished Professor of Sociology at the University of Pittsburgh.